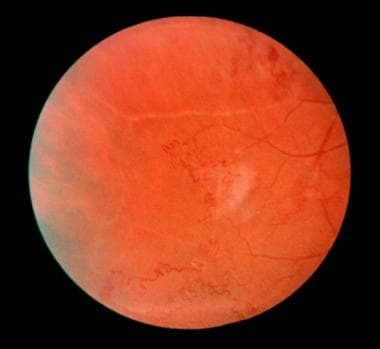 Eales disease is an idiopathic obliterative vasculopathy that usually involves the peripheral retina of young adults. In 1880, Henry Eales first described it in healthy young men with abnormal retinal veins and recurrent vitreal hemorrhages. Eales disease. Fundus photo of the peripheral retina, revealing vascular tortuosity and peripheral retinal neovascularization. Eales disease is uncommon, with most reports based upon a series of cases. Eales disease is most commonly seen in India and portions of the Middle East. No known mortality is associated with Eales disease. Visual compromise is seen in patients with recurrent vitreous hemorrhage; however, the visual acuity resolves to better than 20/200 in greater than 70% of patients. If retinal nonperfusion extends into the macula, the visual acuity usually is worse than 20/400. No racial predilection is known in Eales disease; however, the disease is more prevalent in India and portions of the Middle East. Peak age of onset for Eales disease is 20-35 years, with a reported range of 13-63 years. More than 90% of Eales disease patients can be brought to a morphological standstill with unchanging visual acuity. Patients with Eales disease should be educated to report visual symptoms of floaters or decreased vision to their ophthalmologist as soon as possible, in order to implement effective treatment and to prevent the need of vitrectomy surgery for vitreous hemorrhage or retinal detachment. Singh R, Toor P, Parchand S, Sharma K, Gupta V, Gupta A. Quantitative polymerase chain reaction for Mycobacterium tuberculosis in so-called Eales' disease. Ocul Immunol Inflamm. 2012 Jun. 20(3):153-7. [Medline]. Gieser AS, Murphy RP. Eales disease. Retina. 1994. Vol 2: 1503-07. Eller AW, Bontempo FA, Faruki H, Hassett AC. Peripheral retinal neovascularization (Eales disease) associated with the factor V Leiden mutation. Am J Ophthalmol. 1998 Jul. 126(1):146-9. [Medline]. Phanthumchinda K. Eales' disease with myelopathy. J Med Assoc Thai. 1992 Apr. 75(4):255-8. [Medline]. Sawhney IM, Chopra JS, Bansal SK, Gupta AK. Eales' disease with myelopathy. Clin Neurol Neurosurg. 1986. 88(3):213-5. [Medline]. Gordon MF, Coyle PK, Golub B. Eales' disease presenting as stroke in the young adult. Ann Neurol. 1988 Aug. 24(2):264-6. [Medline]. Kutsal YG, Altioklar K, Atasü S, Kutluk K, Atmaca L. Eales' disease with hemiplegia. Clin Neurol Neurosurg. 1987. 89(4):283-6. [Medline]. Antiguedad A, Zarranz JJ. [Eales' disease involving central nervous system white matter]. Neurologia. 1994 Aug-Sep. 9(7):307-10. [Medline]. Katz B, Wheeler D, Weinreb RN, Swenson MR. Eales' disease with central nervous system infarction. Ann Ophthalmol. 1991 Dec. 23(12):460-3. [Medline]. Rajpal, Singh UB, Mohapatra S, Wagh VK, Porwal C, Kaushik A. Association of Mycobacterium tuberculosis in the causation of Eales' disease: an institutional experience. Indian J Med Microbiol. 2015 Feb. 33 Suppl:43-5. [Medline]. Ramanujam S, Muthuvel B, Aravind C B, Biswas J, Konerirajapuram NS. The 88-kDa Eales' protein in serum is a complex of haptoglobin, complement C3, and galectin-1 as identified by liquid chromatography coupled mass spectrometry. Proteomics Clin Appl. 2017 Jan. 11 (1-2):[Medline]. Saxena S, Pant AB, Khanna VK, Agarwal AK, Singh K, Kumar D. Interleukin-1 and tumor necrosis factor-alpha: novel targets for immunotherapy in Eales disease. Ocul Immunol Inflamm. 2009 May-Jun. 17(3):201-6. [Medline]. Murugeswari P, Shukla D, Kim R, Namperumalsamy P, Stitt AW, Muthukkaruppan V. Angiogenic potential of vitreous from Proliferative Diabetic Retinopathy and Eales' Disease patients. PLoS One. 2014. 9 (10):e107551. [Medline]. Sen A, Paine SK, Chowdhury IH, Mondal LK, Mukherjee A, Biswas A. Association of interferon-gamma, interleukin-10, and tumor necrosis factor-alpha gene polymorphisms with occurrence and severity of Eales' disease. Invest Ophthalmol Vis Sci. 2011 Jan. 52(1):171-8. [Medline]. Narayanan IG PhD, Saravanan R MSc, Bharathselvi M Msmlt, Biswas J Md, Sulochana KN PhD. Localization of Human Copper Transporter 1 in the Eye and its Role in Eales Disease. Ocul Immunol Inflamm. 2016 Jan 25. 1-6. [Medline]. Kharel Sitaula R, Iyer V, Noronha V, Dutta Majumder P, Biswas J. Role of high-resolution computerized tomography chest in identifying tubercular etiology in patients diagnosed as Eales' disease. J Ophthalmic Inflamm Infect. 2017 Dec. 7 (1):4. [Medline]. Goel N, Kumar V, Arora S, Jain P, Ghosh B. Spectral domain optical coherence tomography evaluation of macular changes in Eales disease. Indian J Ophthalmol. 2018 Mar. 66 (3):433-438. [Medline]. Bhooma V, Sulochana KN, Biswas J, Ramakrishnan S. Eales' disease: accumulation of reactive oxygen intermediates and lipid peroxides and decrease of antioxidants causing inflammation, neovascularization and retinal damage. Curr Eye Res. 1997 Feb. 16(2):91-5. [Medline]. Sulochana KN, Biswas J, Ramakrishnan S. Eales' disease: increased oxidation and peroxidation products of membrane constituents chiefly lipids and decreased antioxidant enzymes and reduced glutathione in vitreous. Curr Eye Res. 1999 Sep. 19(3):254-9. [Medline]. Agrawal S, Agrawal J, Agrawal TP. Intravitreal triamcinolone acetonide in Eales disease. Retina. 2006 Feb. 26(2):227-9. [Medline]. Chanana B, Azad RV, Patwardhan S. Role of intravitreal bevacizumab in the management of Eales' disease. Int Ophthalmol. 2010 Feb. 30(1):57-61. [Medline]. Moyenin P, Grange JD. [Eales' syndrome. Clinical aspects, therapeutic indications and course of 29 cases]. J Fr Ophtalmol. 1987. 10(2):123-8. [Medline]. Kucukerdonmez C, Akova YA, Yilmaz G. Intravitreal injection of bevacizumab in Eales disease. Ocul Immunol Inflamm. 2008 Jan-Feb. 16(1):63-5. [Medline]. Kumar A, Sinha S. Rapid regression of disc and retinal neovascularization in a case of Eales disease after intravitreal bevacizumab. Can J Ophthalmol. 2007 Apr. 42(2):335-6. [Medline]. Patwardhan SD, Azad R, Shah BM, Sharma Y. Role of intravitreal bevacizumab in Eales disease with dense vitreous hemorrhage: a prospective randomized control study. Retina. 2011 May. 31(5):866-70. [Medline]. Shanmugam MP, Badrinath SS, Gopal L, Sharma T. Long term visual results of vitrectomy for Eales disease complications. Int Ophthalmol. 1998. 22(1):61-4. [Medline]. Das T, Namperumalsamy P. Combined photocoagulation and cryotherapy in treatment of Eales' retinopathy. Preliminary report. Indian J Ophthalmol. 1987. 35(5-6):108-18. [Medline]. Elliot AJ. 30-year observation of patients with Eale's disease. Am J Ophthalmol. 1975 Sep. 80(3 Pt 1):404-8. [Medline]. Gieser SC, Murphy RP. Eales disease. Principles and Practice of Ophthalmology. 1994. 2: 791-795. Magargal LE, Walsh AW, Magargal HO, Robb-Doyle E. Treatment of Eales' disease with scatter laser photocoagulation. Ann Ophthalmol. 1989 Aug. 21(8):300-2. [Medline]. Masson C, Denis P, Prier S, Martin N, Masson M, Cambier J. [Eales' disease with neurologic disorders]. Rev Neurol (Paris). 1988. 144(12):817-9. [Medline]. Renie WA, Murphy RP, Anderson KC, et al. The evaluation of patients with Eales' disease. Retina. 1983 Fall-Winter. 3(4):243-8. [Medline]. Singhal BS, Dastur DK. Eales' disease with neurological involvement Part 1. Clinical features in 9 patients. J Neurol Sci. 1976 Mar. 27(3):313-21. [Medline]. Spitznas M, Meyer-Schwicherath G, Stephan B. Treatment of Eales' disease with photocoagulation. Albrecht Von Graefes Arch Klin Exp Ophthalmol. 1975. 194(3):193-8. [Medline]. Spitznas M, Meyer-Schwickerath G, Stephan B. The clinical picture of Eales' disease. Albrecht Von Graefes Arch Klin Exp Ophthalmol. 1975. 194(2):73-85. [Medline]. Eales disease. Fluorescein angiogram of late leakage from peripheral retinal neovascularization.